-Robust: L-Tex knee protection and durable Nylon to protect the suit from wear and tear. -Water_Gate_Plus: All ION GBS semidry wetsuits (long arms and legs,) are equipped with the Water_Gate_Plus batwing panel, placed on the back behind the zip. 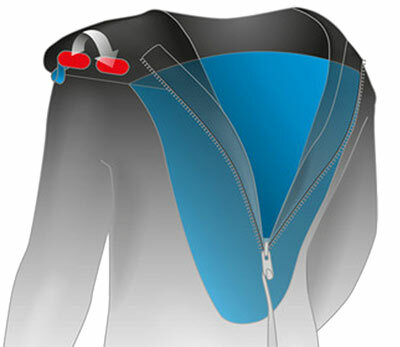 Its purpose is to act as a barrier against water which likes to seep into the suit via the back zip. Line Concept: Enter the world of ION with the ELEMENT. A premium all-rounder guaranteed to deliver a lot of bang for your buck! Offering comfort and protection in all the right places, it’s the perfect entry level suit for keen watermen. Supple, stretchy and robust it also includes many features from the more technical end of the line. The short armed Overknee and Steamer (manufactured in GBS constructions,) are equipped with a shoulder high reinforcement to act as a barrier against water.